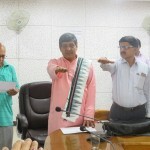 Click Here to Download Admit Card for Shiksh Shastri and Shiksha Acharya Entrance Test - 2019-2020. Notification regarding change of date for Entrance Examination of SSET and SAET for the year 2019-2020. Inviting tender for printing card and booklet -reg. DETAILED NOTIFICATION OF VACANCY FOR RECRUITMENT - 2019. Notification regarding Board of Management. Notification regarding Tender for Reprinting of Books. Notification for Financial Assistance for the year 2019-20 under Schemes. Notification regarding status of Deemed to be University for Rashtriya Sanskrit Sansthan. Detailed Notification of Vacancy - Deputy Director Finance 2019. Notification regarding extension of date for Submission Application form of SSET and SAET for the year 2019-2020. Tender invitation for publication of various books –reg. Reservation for Economically Weaker Sections (EWSs) for the admissions to Shiksha Shastri (B.Ed.) and Shiksha Acharya (M.Ed.) Courses. Notification regarding nomination of member in Board of Management. Notification regarding appointment of Controller of Examination. Guidelines for conducting written examination for Persons with Benchmark Disabilities. REPORTING OF NEWLY ADMITTED RESEARCH-SCHOLARS(विद्यावारिधि ) FOR COURSE-WORK. Selection Criteria and Scheme of Examination for the post of Curator. Notification regarding appointment of Registrar. Construction of Additional floor and Beautification of campus of Rashtriya Sanskrit Sansthan at Janakpuri, New Delhi. SH: Engagement of Consultant. Online Registration for 16th Sanskrit Natyamahotsav 2018-2019. Submission of Immovable Property Return by the Employees of autonomous and subordinate institutes/ organization in the Ministry of HRD. Online Application for Entrance Test 2019 for Shiksh Shastri and Shiksha Acharya. Notification regarding Vidyavaridhi Admission Result 2018-2019. Important Notification for applicants connected to Sansthan's Advertisement No. 03/2018. Notification regarding counselling schedule for Vidya Varidhi admissions 2018-2019. Click here for Online Application Form for Recruitment 2018. Notification regarding Extension of date for online registration of scholarship for the year 2018-2019. Bond format for Ashtaadashi (18 Projects). Notification for Financial Assistance for the year 2018-19 under the Schemes for Development of Sanskrit Education. Notification For Financial Assistance for the year 2018-19 under “Ashtaadashi” (18 Projects). View: Guidelines and Application Form for “Ashtaadashi” (18 Projects). 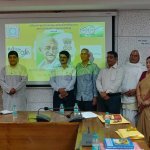 Notifications regarding Vidya Varidhi (Ph.D.) degree awarded by Sansthan. Result of Pre Ph. D. Course 2017-2018. 3rd Counselling Notification of CSSET 2018 for admission in Shiksha Shastri. View: Campus Wise Selected Candidates list. View: Roll No wise Campus allocation. 2nd Counselling Notification of CSSET 2018 for admission in Shiksha Shastri. The date & venue of the counselling for Shiksha Acharya Admission. Counselling Notification of CSAET 2018 for admission in Shiksha Acharya. Notification Regarding the Examination of Diploma Courses shifted from 10/06/2018 to 11/06/2018. Notification Regarding the Examination of MSP shifted from 10/06/2018 to 17/06/2018. Shiksha Shastri(B.Ed.) CSSET, Shiksha Acharya(M.Ed.) CSAET, Vidyavaridhi(Ph.D.) CVVET-2018 Hall Ticket. Notification regarding extension of last date for CSSET/CSAET/CVVET - 2018. Online Examination Fee Collection form of Sansthan Campuses. Online Application CSSET, CSAET, CVVET 2018. WALK IN INTERVIEW FOR ENGAGEMENT OF CONSULTANT (FINANCE) ON CONTRACT BASIS. Admit Card for Skill Test in Stenography for the post of Stenographer Grade-I and Grade-II. Date and Venue of Skill Test in Stenography and Instructions for qualified candidates called for appearing in Skill Test in Stenography for the post of Stenographer Grade-I and Stenographer Grade-II. Notification regarding candidates selected for Assistant Director (Correspondence Course) and Section Officer. Extension of Date submission for Online Application for various Non-Teaching Posts. Final Result of Candidates based on Merit for the post of Lower Division Clerk (LDC) at Headquarter office of Rashtriya Sanskrit Sansthan (Deemed University), New Delhi. 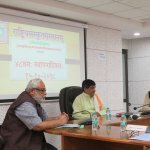 The result of candidates appeared in Computer Typing Skill Test for the post of LDC in Headquarters office of the Rashtriya Sanskrit Sansthan (Deemed University), New Delhi conducted on 03.06.2018. Advertisement for the post of Development Officers and Post Doctoral Fellowships in Pali and Prakrit Scheme of Sansthan. 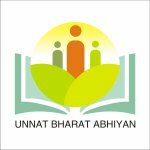 INSTRUCTIONS FOR CANDIDATES CALLED FOR APPEARING IN COMPUTER TYPING SKILL TEST FOR THE POST OF LOWER DIVISION CLERK IN RASHTRIYA SANSKRIT SANSTHAN (DEEMED UNIVERSITY) 56-57,INSTITUTIONAL AREA,JANAKPURI NEW DELHI, SCHEDULED TO BE CONDUCTED ON 03.06.2018. NOTIFICATION FOR DECLARATION OF RESULT OF WRITTEN TEST CONDUCTED FOR THE POST OF LOWER DIVISION CLERK. Important Instruction to Candidates attending LDC Examination. Click here to download Admit Card for Lower Division Clerk Examination - 2018. Notice to the Candidates attending the LDC Examination. Instructions and Model Question Paper for LDC Examination. NOTIFICATION REGARDING WRITTEN EXAMINATION FOR THE POST OF LOWER DIVISION CLERK IN THE SANSTHAN. Notification regarding Candidates selected for different posts. 1. List of Eligible, Provisionally Eligible and Not Eligible Candidates. 2. List of Candidates not considered due to late receipt of application. 1. List of Eligible, Provisionally Eligible candidates. 2. List of Rejected candidates - Due to late reciept of application. Notification regarding Selection Criteria and Scheme of Examination for the following Posts. DETAILED NOTIFICATION OF VACANCY FOR RECRUITMENT. DOWNLOAD : Application Form for Non-Teaching Posts advertised on 24/12/2016. DOWNLOAD : Application Form for Teaching Posts advertised on 24/12/2016. Notification of Limited Departmental Competitive Examination (LDCE) of Section Officer / Assistant / LDC. Rashtriya Sanskrit Sansthan is a premier Institution for promoting Sanskrit studies in India and abroad. Founded in 1970, it is the biggest Sanskrit University in the world today. Also, it is the only Multi-Campus Sanskrit University in India. 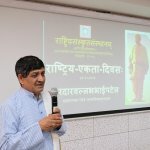 Development of Rashtriya Sanskrit Sansthan as a world-class university for establishment of the glory of Sanskrit learning in the global context. All round development of all the branches of Sanskrit learning and availability of Sanskrit resources through modern systems. Upliftment of linguistic diversity and cultural plurality while arranging for teaching and research in Sanskrit, Pali and Prakrit in the context of their mutual cultural inter-relationship. 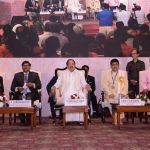 Preservation and upliftment of the philosophical and scientific elements in the knowledge systems of these languages and ensuring their availability through the equipments of information and communication technology while establishing the relationship of these knowledge systems with cultural legacy.